Kara: I recognized these little plastic containers as soon as I saw them! We just started feeding our 6 month old solid foods so our cupboard is now stocked with them. Here's a creative way to recycle them if you have other children a little older...just wash them out and fill them up with snacks. They are easy to pop in you purse or diaper bag and the food won't get squashed like it would in a plastic baggie. 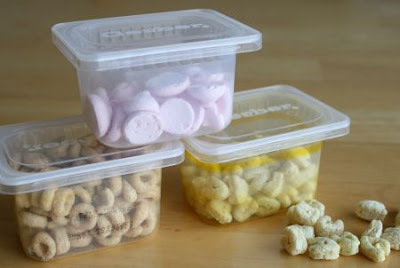 Ashley: On the subject of snacking....I love this idea about pre-portioning out your kids snacks. It might take a little extra work in the beginning, but what a great way to teach portion control and prevent mindless snacking. Tracy: I truly love every piece of artwork my daughter creates, but sometime I think "where am I going to put this?" Here are some great ideas and tips on how to tackle artwork overload! Friday nights are family night at my house. 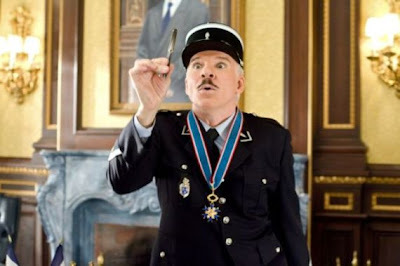 We play board and card games, watch sporting events, and .. .. Fondue! Deep in my corner cabinet, I found a fondue pot that had been given to me years ago. (How did you guess that it was a gift from my mother-in-law?) I had used it once, packed it away, and forgot about it. Last Friday night, I dusted it off, read the recipe booklet and planned a fun evening of games and fondue. My kids loved it! They had a blast making their own dessert. We dipped marshmallows, pound cake, strawberries, and bananas in melted milk chocolate. The marshmallows were their absolute favorite. With the Winter Olympics starting next month, I think it will be fun to cook our main dish with a little help from our new-found friend, our fondue pot. Wish me luck! TODAY ONLY - Enjoy $5 Shipping on any order! (No Minimum!). 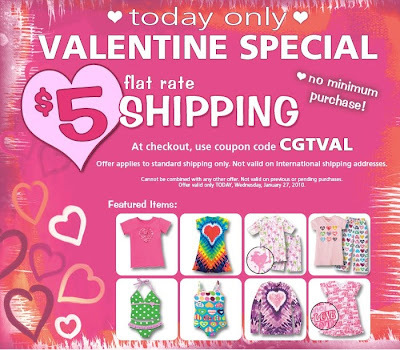 Just enter code CGTVAL in the coupon code box during checkout. Looking for something sweet for your Valentine? Shop our Valentine's Day Collection here! February 2 is Groundhog Day. My children are fascinated by this holiday and a groundhog’s ability (or inability) to predict the weather. 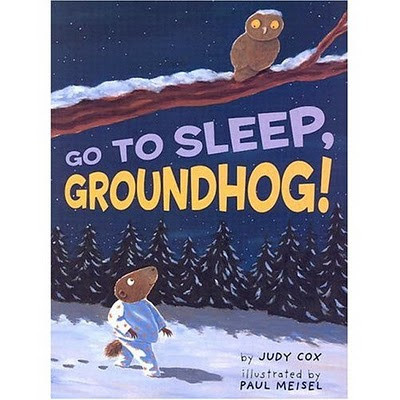 This terrific book Go To Sleep, Groundhog! by Judy Cox imagines what a groundhog really does while he is hibernating. The author tells an engaging story about a groundhog and his battle to stay asleep all winter long. After a bit of tossing and turning, this cute groundhog finally falls asleep. On February 2, he is awakened by his alarm clock. He peeks out of his underground home, sees his shadow and scurries back inside to enjoy six more weeks of sleep! I enjoyed this book for its delightful story and colorful illustrations. At the end of this book, you will find a short history of Groudhog's Day. Your kids will enjoy learning that before we had television and the internet, early farmers had all sorts of ways to try to forecast the weather, even watching a groundhog awake from a long winter's sleep! Let's hope this year the groundhog does NOT see his shadow. I am ready for spring!!! Step out in style! 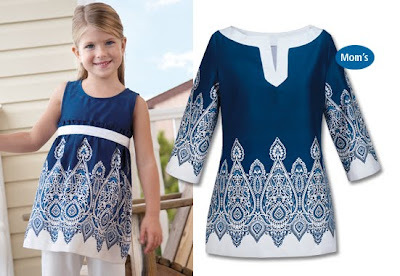 Mother's and daughter's can look alike in these fashionable blue and white matching tunic tops. Tunics are all cotton, CWDkids exclusives, and Made in the USA. Shop all Mother/Daughter styles Here. Jim: Have you ever noticed that your kids after school activities and sporting events always seem to be stocked with some sort of snack? 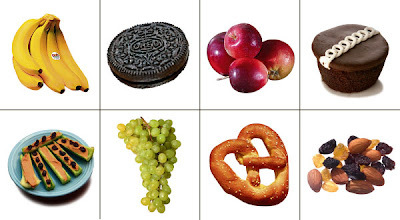 Have we really decided that snacking has become "constant and mandatory" for children today? Read this interesting article from the New York Times about the rise in snack popularity and what parents think of all this "extracurricular eating". Ashley: Want to get creative with your valentine's this year? Well, the Chinese New Year starts on Valentines day....Look here for for a cute idea to meld the two holidays together by making Valentine fortune cookies! Kara: I'm pretty sure my husband and I just had the exact conversation that the woman in this video had with her husband. Can she PLEASE come to my house and help me plan a year's worth of dinners!? Click the image below for a closer look at a really cool diagram of the history of children's clothing. My, how far we've come! Wow, this has been the season for braces at my house! Last week, my fourteen year-old son had braces put on his teeth. It was quite a painful experience that he milked for all of the extra attention and take out food he could get. This week, my eleven-year-old daughter (and me) has been shocked by the news that she needs braces put on her very crooked teeth ASAP. She is scheduled to have her braces put on next week. Phew. It is whirl wind of milkshakes, soft foods, and Advil at this house. This is all new to my children and me. Have you ever tried to floss with braces? This is a nearly impossible task and mind-boggling for a child to attempt. The worst part is preparing for the storm that is going to erupt at home when my oldest son realizes that he and his sister will be sporting their metal at the same time. He is already distraught that he will be one of the last in his class to wear braces and now, he must deal with the sad fact that his younger sister will be wearing braces at the same that he will be. Ahhh, the joys of raising adolescents! Win One of Five $50 Gift Certificates! Spread the word! 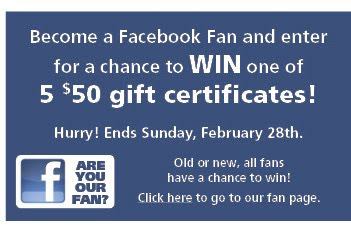 CWDkids is giving away FIVE $50 gift certificates to our Facebook Fans! All you have to do is become a Fan of CWDkids. If you are already a fan, don't worry, you are automatically entered to win. Now, share the good news and tell your friends about the giveaway, deadline is February 28! Noon EST - 4PM PST...Don't forget to enter code CGT5SH! Start Shopping Now! 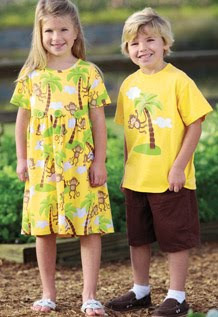 Whimsical monkeys swing from the palm trees on this playful dress and t-shirt, a CWDkids Exclusive! Perfect for a trip to the zoo, birthday parties, or just "hanging around"! Easy to wear pull-over dress and cotton jersey tee are fun to wear and make an adorable brother/sister matching outfit. Get the camera ready! Shop the monkey outfits now! Shop all brother/sister outfits now! I just found out that January is National Oatmeal Month! It has been so cold this month that oatmeal has definitely been the most requested breakfast at my house. According to the Quaker folks, more people eat oatmeal in January than any other month. Oatmeal is good for our hearts because it may help to reduce blood pressure. According to Candace Buckley, oatmeal makes us feel fuller which can help reduce snacking and start your children’s day off right. 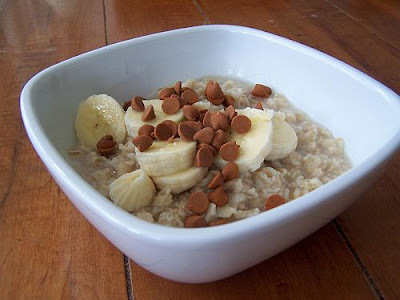 Click here to find delicious recipes your family will love and will help you add some more healthy oatmeal to your meals. For a Limited Time Only, select Fall/Winter Dresses are drastically reduced! 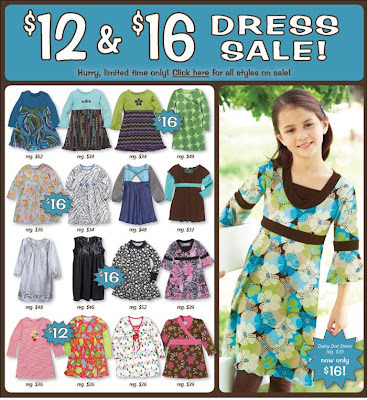 Check out this amazing sale with great deals on dresses! Start Shopping Now. Kara: I have become obsessed with a blog I was recently introduced to called Young House Love. I am so intrigued with this adorable couple and love watching them transform their first home into a sleek and stylish abode. They are the masters of DIY projects...check it out for yourself! 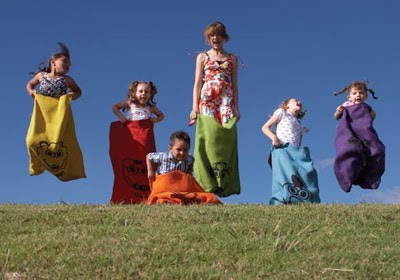 Tracy: Turn exercising into a game with these great ideas from Grandparents.com! These fun games will get the kids moving instead of watching TV, will keep you active as well, AND it's great quality time spent with the family. Ashley: I have always wanted to know how to tie up a package as wonderfully as they do at that jewelry store, Tiffany & Co. Finally, I have found a video on the Small Notebook blog which reveals the secret to tying a fabulous bow! The ever-so-popular maxi dress is back this season! Inspired by the laid back, west coast surfer style, these casual and pretty dresses are the perfect warm-weather look. They offer just a touch of sophistication, but are still age appropriate for young girls. *Dual purpose--can be worn as an everyday dress, or bathing suit cover-up! *Fabric is lightweight and comfortable. *Bold patterns and colors remind us of tropical get-aways. *Maxi length offers plenty of coverage from the sun. *Add a cardigan and they are ready for cooler evenings. 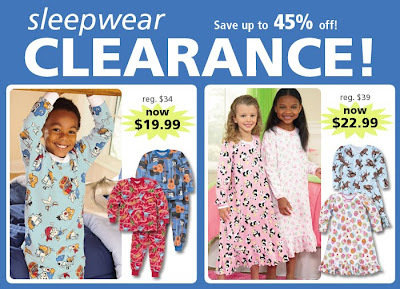 Save up to 45% on Winter Sleepwear! Lots of styles to choose from, Long Johns, Gowns, and Short Johns. Hurry while inventory is still in stock! Start Shopping Now. I cannot believe it. I actually achieved one of my New Year’s resolutions on the ninth day of the first month of 2010. That is a lifetime record for me! On Saturday morning, I woke up with a mission. I decided that I was ready to conquer my basement. I started pulling the basement and all of its contents apart first thing in the morning. Lucky for me, my eleven-year-old daughter was willing to help. Six hours later, we had organized our stored clothing, holiday supplies and random house wares that I had haphazardly thrown in to my poor neglected basement. I gave a lot of clothing to a local charity and felt like I had really accomplished something when we were finished. I told my daughter that I was now inspired to take on the garage.. She laughed and said let’s tackle that in 2011! 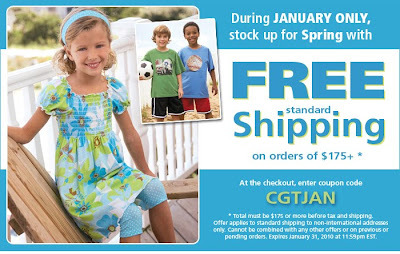 Enjoy Free Standard Shipping in January on any order of $175 or more! Just enter code CGTJAN in the coupon code box during checkout. Offer expires 11:59pm EST 1/31/10. Do you have a "Lilly Girl"? 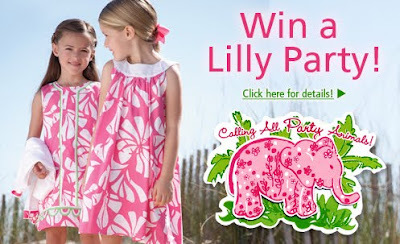 Enter to win her a Lilly Pulitzer party! Prize includes a Lilly Pulitzer dress, invitations, decorations, and much, much more! No purchase necessary, enter by 4/1/10. Click Here for more details! The Second Grade Pencil Caper! My second grade son got in to my car this afternoon with a very serious face. I really had no idea what he was going to tell me. You never know what you are going to be hear from a seven-year old and I have to say I could not have dreamed up this story. My son watched The Pink Panther movie over the break so I am guessing he thinks it his job to solve the mystery and smoke out the pencil-clogging villain. I told him that he should stay out of this caper, but that if he did find out who was clogging up the school toilet to please NOT invite him to our house! View the Backs of Swimsuits! The back of the swimsuit can be just as important as the front! To see the back of our swimsuits, simply click on "zoom/alt views" located below the product image. Shop our girl's swimwear collection now! 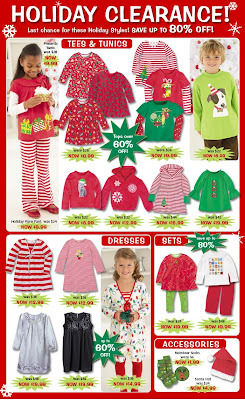 Wednesday Deal of the Day - Up to 80% Off Holiday Styles! This is your final chance to buy for next year and save! Discounts up to 80% Off Christmas styles and accessories. Shop Now while inventory is still in stock! Guess what my New Year's Resolution is this year? (or ReVolution if you are talking to my seven-year-old son) TO GET ORGANIZED! My kids are back in school after a very long winter break. The house is a mess. It truly looks like my kids set bombs off in their closets so I guess it is time to make good on my new promise for 2010 and get to work! I am starting with my kids' closets. Their closets are filled with clothes from last year and this year and it is impossible to find anything! 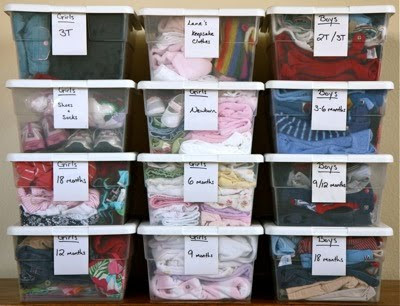 With three children, this is not an easy task as clothes must be saved and keeping things neat is not my strong suit. I am going to start my project by dividing my children’s clothing and shoes in to three piles: keep, donate, or store for my youngest child. I hope to have my basement looking like this photo from the Small Notebook blog. Click here to find some more helpful tips to help you get started! If you have any ideas that keep your family organized, PLEASE let me know! What a great way to start the 2010...Our most popular customer favorites have been marked down even further! 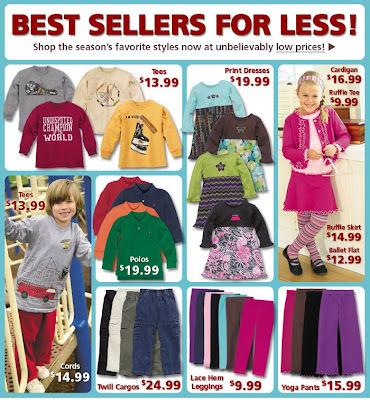 Check out these great styles on sale an unbelievably low prices. Start Shopping Now! This Weeks Fave's - Happy 2010! Kara: View this image gallery Time Magazine's 2009 Images of the Year. Such beautiful, inspiring, and tragic global events remind us of the past year. Tracy: Feeling a little sluggish this morning? Read this article about healthy ways to detox after the holidays. Gotta go...my daily jog will do the trick! Ashley: Celebrate 2010 with you kids by getting fit! I found this article on PBSparents.com about motivating kids to get moving. Encourage exercise when ever you can...ride bikes, go ice-skating, even Wii Rock Band is a workout. Here's to a healthy New Year! 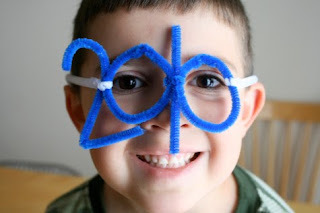 Happy New Year From Everyone At CWDkids!